"Physical cash is unlikely to be the main answer to the future needs for payment" recognizes the Bank for International Settlements (BIS), the bank of central banks. However, the appearance of a fully dematerialized currency, 100% digital, issued by a central bank is not for now. According to a survey of large and small central banks around the world, unveiled on Tuesday, January 8 by the BIS and which we had unveiled the first results in November, 70% of institutions surveyed say work on the concept of a digital currency of central bank, the main motivation being to respond to the decreasing use of cash. They are only 31% to consider only an interbank version of this currency, the others exploring a consumer version or both. The 63 institutions that responded represent 80% of the world's population and 90% of GDP, including the US Fed, the Bank of France, the German Buba, the British BoE, the Japanese BoJ, the European Central Bank, as well as those of China, Morocco, the Solomon Islands or Zambia. That said, only five central banks claim to be involved in an experimental project, including the Riksbank in Sweden with its e-krona and Uruguay with the ePeso pilot which ended in April 2018. The others are not mentioned. We know that Thailand is working on it. Ecuador had tested a "dinero electrónico" that he gave up for lack of adoption. 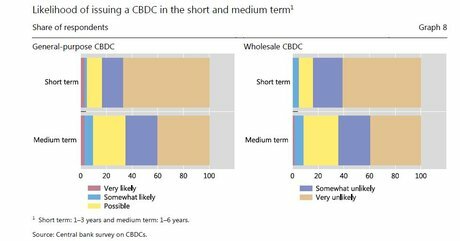 Asked about the horizon they expect to emit for good such a legal virtual currency, 85% of central banks surveyed said it was "Unlikely or very unlikely" that this will happen in the short term, within one to three years. In the medium term, that is, in the next six years, more than 35% of "Possible, likely or very likely". A result that reassures the BIS, worries risks to financial stability such an innovation. "At this point, most central banks seem to have clarified the challenges posed by the launch of a digital currency and are not yet convinced that the benefits will outweigh the costs," says the BIS in the survey report. "This study shows that central banks are proceeding cautiously, collaborating, and sharing the results of their work. Prudence and collaboration will reduce the risk of unwanted consequences. " The European Central Bank (ECB) is conducting a research project, Stella, with the Bank of Japan, on the use of distributed (DLT) Blockchain) for financial market infrastructures: a first step in September 2017 concluded that the technology was not mature enough to be deployed for large payments as on the ECB's Target 2 system, where interbank settlements are carried out in central bank money. The second phase of the Stella project investigated the possibility of a distributed digital register for the settlement of financial securities transactions, a more promising area for both institutions. For their part, the Bank of England, the Bank of England and the Central Bank of Singapore are working together on the concept of a legal digital currency for cross-border payments. As part of this investigation, the BIS also asked the question of the current use of crypto-currencies such as Bitcoin and more generally crypto-active, for example tokens issued in the context ofInitial Coin Offerings (ICO), this new mode of fundraising. Uses would be very limited according to the findings of the surveyed institutions. "No central bank has reported significant use or the general public crypto-currencies for national payments or cross-border in their jurisdiction," says the BIS, which is known little crypto-enthusiastic, the image most central banks. The use of crypto is described by 58% of institutions surveyed "Negligible"or nonexistent, or confined to "Niches" users at 28% in the national market (32% cross-border). Above all, the central banks recognize that they have no idea of ​​the evolution to come: they are 51% to answer that they do not know if the use of crypto-currencies for payment is brought to increase or decrease. And all the more so because they admit that the brakes for this use include low acceptance in store, compliance issues, limited public understanding and simply the ban that exists in some countries. Other studies show that the value and the volume of exchanges in cryptocurrencies are strongly influenced by the regulations.